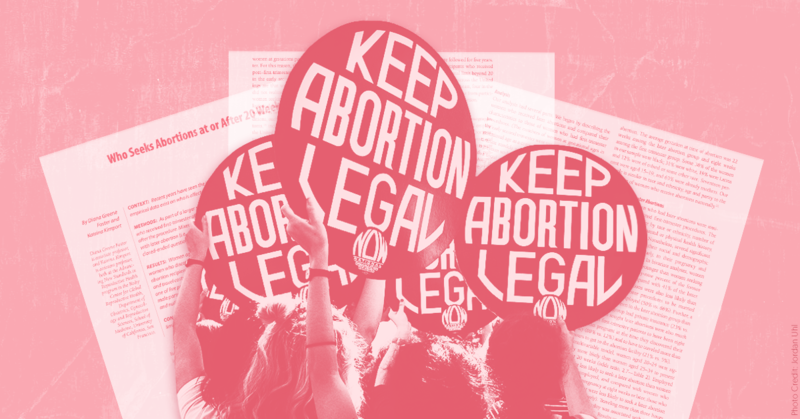 As part of the escalating rhetoric surrounding abortions later in pregnancy, right-wing media and anti-abortion media have consistently -- and erroneously -- pointed to a 2013 study from Advancing New Standards in Reproductive Health as a piece of “gotcha” evidence allegedly disproving arguments about the dangers of restricting later abortion access. 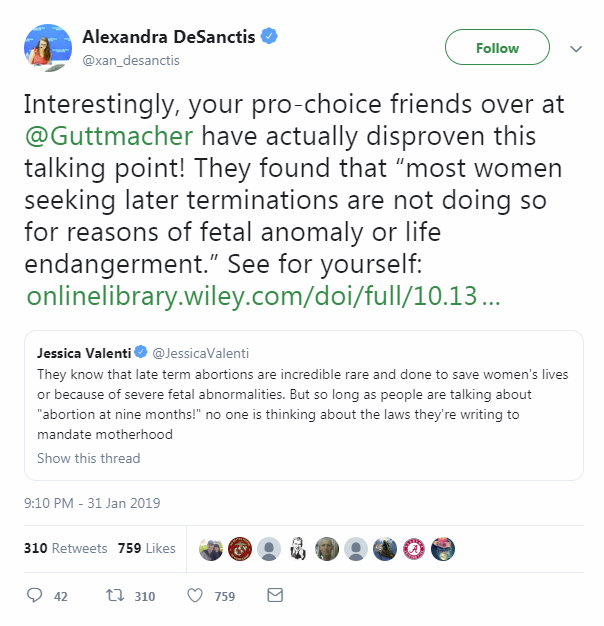 The study doesn't support the purported argument about the frequency of later abortions; that hasn't stopped anti-abortion groups (which repeatedly argue that being "pro-life is pro-science") from touting it -- nor has it stopped other outlets from uncritically allowing or repeating these assertions. 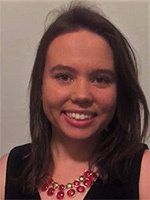 In 2013, Diana Greene Foster and Katrina Kimport authored a study published in the journal Perspectives on Sexual and Reproductive Health (though it is sometimes inaccurately cited as a study by the Guttmacher Institute, a disclaimer at the bottom clarifies that “the views expressed in this publication do not necessarily reflect those of the Guttmacher Institute”). This study examined the potential impact of legislation banning abortions at 20 weeks of pregnancy and attempted to assess the reasons why someone would choose to have an abortion around that time period. This January, as state legislatures in New York and Virginia began considering measures to protect abortion access or to remove unnecessary anti-choice barriers, right-wing media continually cited this 2013 study out of context to allege that Democrats had an extreme position on later abortion access. 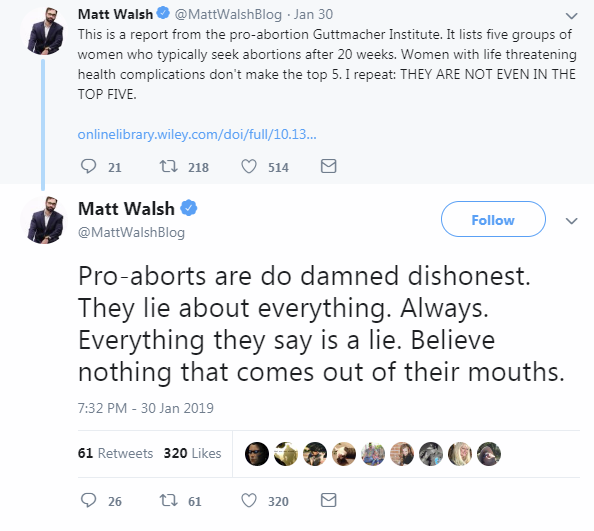 In particular, anti-abortion and right-wing media have cherry-picked language from the introduction of the 2013 study as proof that third-trimester abortions are not performed due to fetal abnormalities or dangers to the life of the pregnant person. 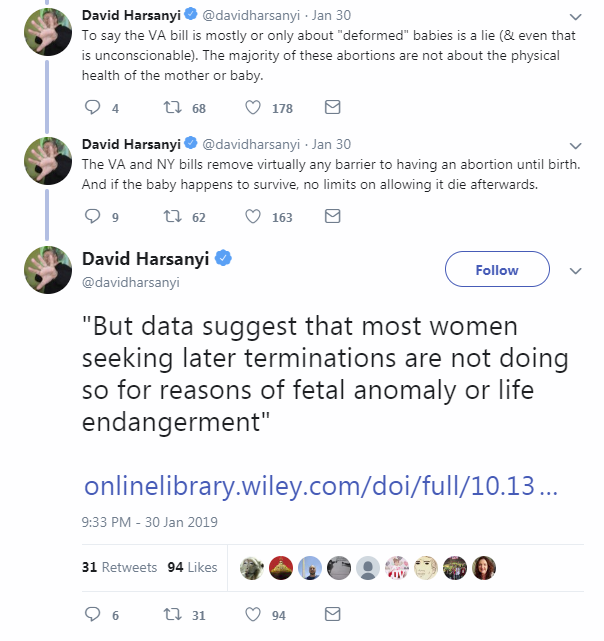 In reality, that is not the time period analyzed by the study and those reasons for seeking an abortion were explicitly excluded from its scope. 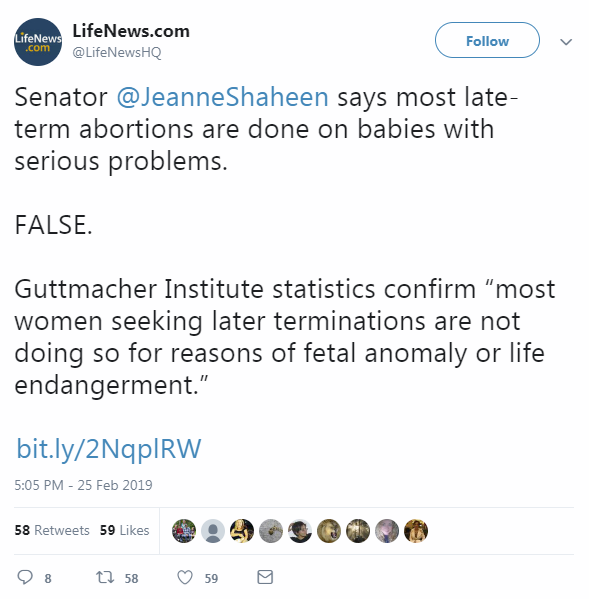 The crux of this disingenuous allegation relies on a misinterpretation of a sentence in the study’s introduction stating that “data suggest that most women seeking later terminations are not doing so for reasons of fetal anomaly or life endangerment.” Right-wing and anti-abortion media have taken this sentence as evidence that few, if any, people seek abortion care in the third trimester due to fetal abnormalities or dangers to the life of the pregnant person. There are several issues with this interpretation. While right-wing media and anti-choice advocates have erroneously cited this study before, faux outrage spun up in reaction to state abortion measures spurred an uptick in the mischaracterizations and misuse of this study -- mischaracterizations that are now spurring inaccurate coverage from other outlets. 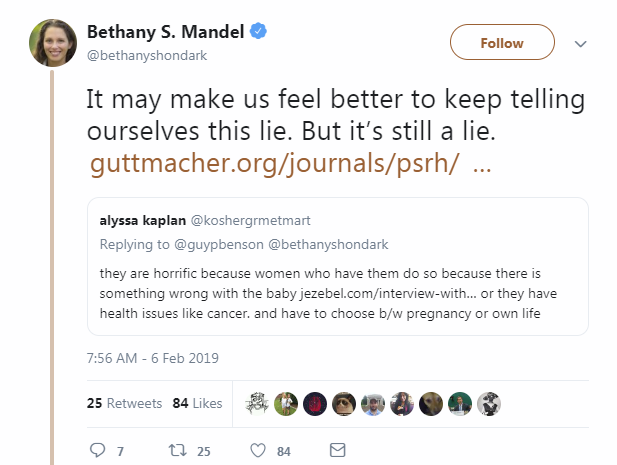 Interestingly, even in some of the anecdotes chosen by Guttmacher, the women describe their decision to have a late-term abortion as “easy” or “very easy.” They didn’t find out they were pregnant until later in the pregnancy, didn’t want the child, and aborted it. Their only challenge was raising the money or finding the clinic. The thought that they were killing a viable infant — a person who would could be raised in a loving home if the mother didn’t want her child — apparently doesn’t factor into their decision-making. It’s treated as casually as an early-term abortion. This is the reality of late-term abortion in America. 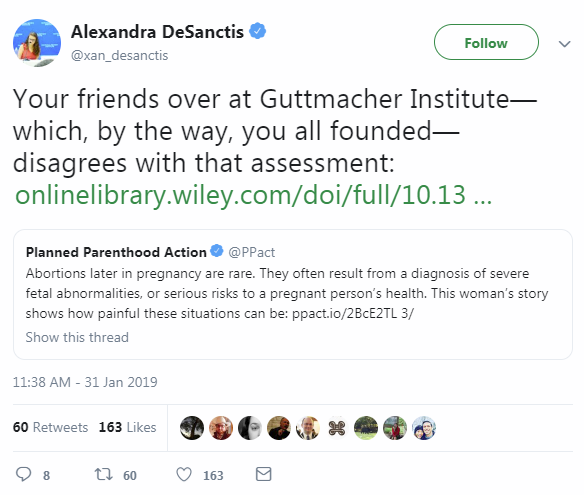 Ed Whelan, president of the Ethics and Public Policy Center, tweeted that the “pro-abortion Guttmacher Institute” refuted pro-choice advocates’ “claims about ‘tragic’ circumstances of most/all late abortions” involving fetal abnormalities or the health of the pregnant person, again citing the 2013 study. No mention of the mother’s life or health being at risk, or of a fetal anomaly. 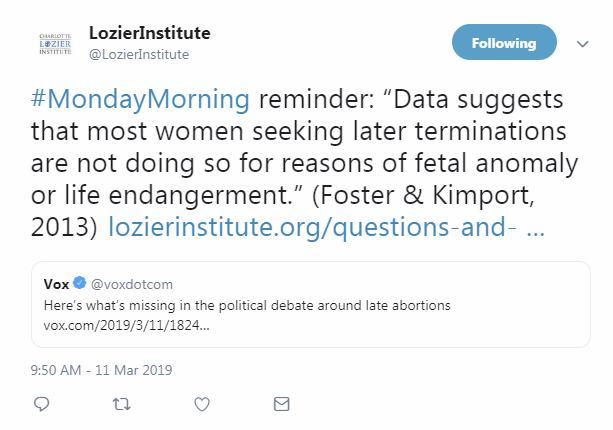 The Charlotte Lozier Institute (CLI) is the research arm of the anti-choice group Susan B. Anthony List, and attempts to brand its members as impartial scientific experts, when in reality the organization has an explicit mission to oppose abortion access. 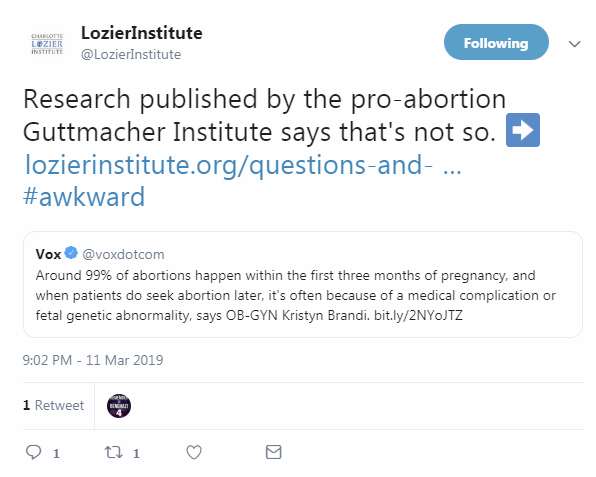 Unfortunately, while right-wing media and anti-abortion groups often cite CLI to support inaccurate claims about abortion, other outlets sometimes rely on them without sufficient context or disclosure about the organization’s ideological purpose. 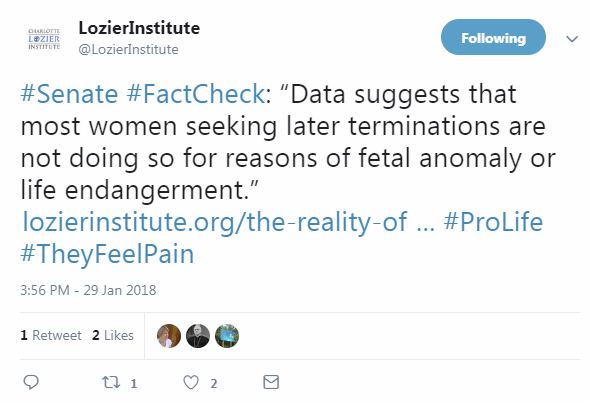 CLI has adopted an inaccurate reading of the 2013 study to support anti-abortion positions, using it in both a “report” and “fact sheet” on their website. 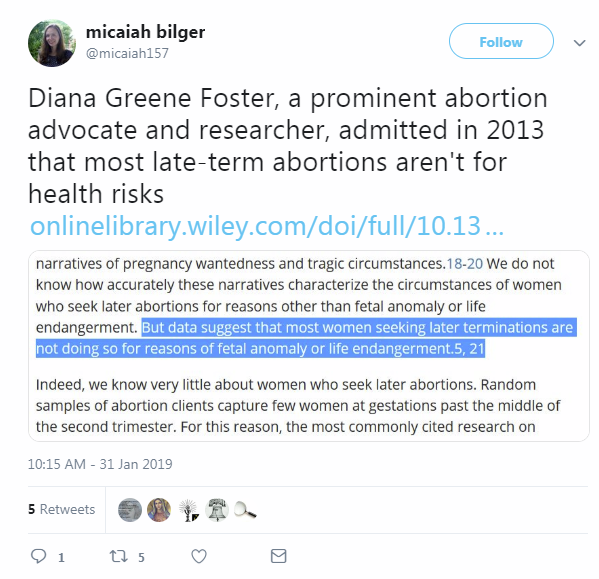 Although in each instance, CLI included a note that the 2013 study does have “significant” limitations, such as excluding those participants seeking an abortion for health risks or fetal abnormalities, both documents still inaccurately conclude that the study is an effective bludgeon for refuting arguments about the reasons people have abortions later in pregnancy. As the hyperbolic “controversy” over the measures in New York and Virginia unfolded, The Atlantic and The Washington Post both gave right-wing misinformation about the 2013 study an uncritical platform in each outlet’s opinion section. Right-wing and anti-abortion media will continue to erroneously cite this 2013 study, and it will likely be rehashed by anti-abortion lawmakers in any number of reports or hearings. 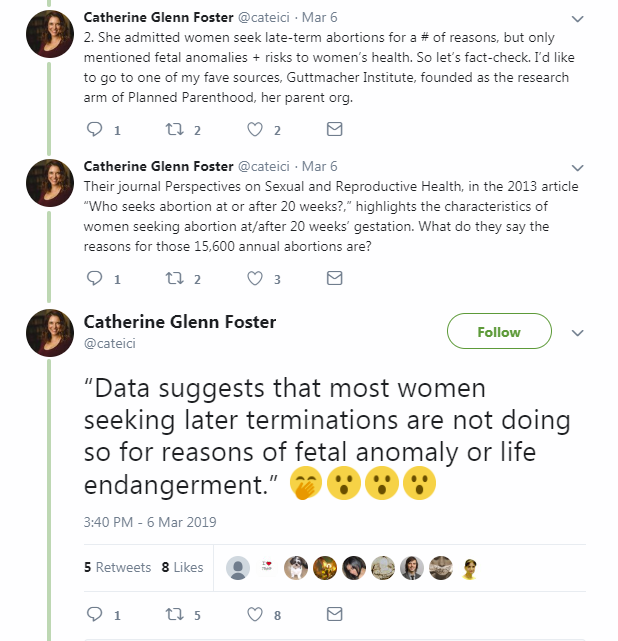 Other outlets have a responsibility not to repeat this inaccurate characterization of the study -- or else they're helping abortion opponents spread further misinformation with potentially dire consequences.